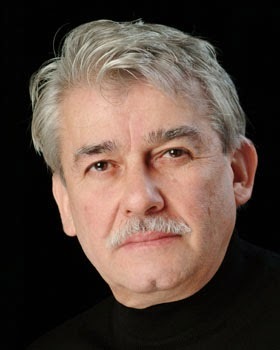 Marco Antonio Rodríguez, shown at right, let us know that the award-winning play that he wrote, La Luz de un cigarrillo, will be produced as the 2014 mainstage production of the Raíces Theater Company in Buffalo, New York, where it will run in November. For more information, click here. The short film You're Dead To Me (written by Adelina Anthony and directed by Wu Tsang) continues its run on the film festival circuit. The film starring Laura Patalano and Harmony Rose Santana was recently screened at the Woods Hole Film Festival at Falmouth, Massachusetts (on Cape Cod). For more information, click here, here or here. Milena Dávila is starring as Bianca in The Drilling CompaNY's production of William Shakespeare's Othello. Directed by Hamilton Clancy, the production is part of the company's Shakespeare in the Parking Lot series, now in its 20th season. The show will run in July and August at the Municipal Parking Lot on the corner of Ludlow and Broome streets in Manhattan's Loísaida neighborhood. For more information, click here. 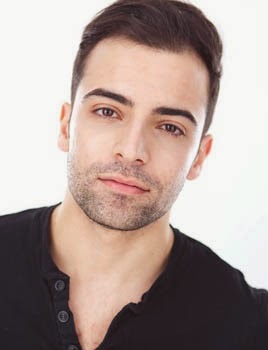 Lucio Fernández is associate producing the short film Ploy (written by Jesse E. Salgado and Julius B. Kelly and directed by Kelly). The film stars Stan J. Adams, Omar Torres, Judy San Román, Jim Thalman and Donny Chávez. For more information, click here. Repertorio Español is presenting Matthew Paul Olmos' Así van los fantasmas de México, primera parte. Directed by Estefanía Fadul, the play will have an August run and will star Felipe Bonilla, David Consejo, David Mila, María Peyramaure and Bobby Plasencia in the cast. For more information, click here. J.W. Cortés, shown at right, booked a recurring role as Detective Álvarez on "Gotham" (Fox). 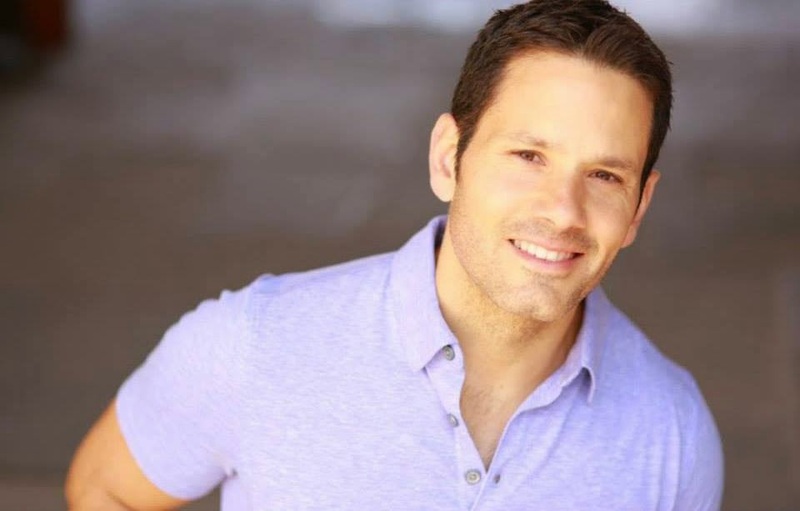 Sebastian Stimman, Héctor Luis Rivera and Kathy Tejada will be acting in the play La reina virgen. Adapted from Francisco Ors's Contradanza and directed by George Riverón, the play is produced by TEBA and Teatro del Aire and will run in the autumn at Broadway Blackbox Theater, located in the Washington Heights neighborhood of Manhattan. The cast also features the talents of Raúl Rivera, Rita Ortiz, Daniel Ojeda Astigarraga, Juan Manuel Sanábria and Sully Bonnelly. Roberto Sanábria, shown at left, booked a World Cup-themed, anti-jaywalking public service announcement viral video through an HOLA referral, and now the video was the subject of a report on Time Warner Cable New York 1 Noticias. To see the report, which is in Spanish, click here. 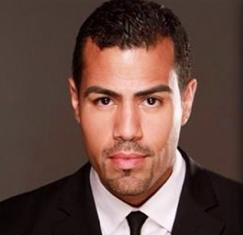 Francisco Ramos was interviewed by Joe Shock López and DJ Lexx on the podcast "Shocking Underground", where he spoke on his leading role as Latin freestyle singer Víctor Velásquez in the feature film The Hardest Love (written and directed by Henry B. Roa). The film is currently hitting the film festival circuit. The interview can be heard by clicking on the icon below. Luis Salgado, shown at right, was profiled in Latin Trends magazine, where he spoke of his current gig on the Flaherty-Ahrens-Meehan Broadway show Rocky: The Musical (based on the Academy Award-winning Sylvester Stallone film and currently set to close on Sunday, August 17, 2014) and of the newest role he is tackling– that of a father to a newborn son. To read the interview, click here. Howard Collado is composing a score, to be played live by him, to Lorraine Rodríguez-Reyes' self-penned solo show Mami Confessions (directed by Susan G. Reid). The show is scheduled to run in July and August at Teatro Círculo, located in Manhattan's East Village. For more information, click here. 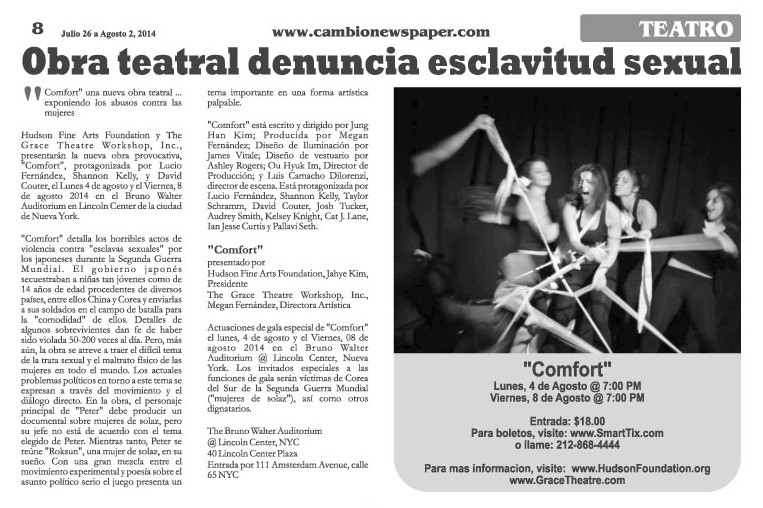 The Hudson Fine Arts Foundation/Grace Theatre Workshop's production of Comfort (written and directed by Jung Han Kim), co-starring Lucio Fernández, was featured in Cambio newspaper. The play, which is currently playing at the Workshop Theatre Company's Jewel Box Theatre (located in the Fashion District of midtown Manhattan), and will follow up that run with additional performances in August at the Bruno Walter Auditorium at Lincoln Center. To read the article, which is in Spanish, click on the image above, at left. Vanessa Verduga and Linda Nieves-Powell have produced the second season of the webseries "Latinas Chat Media". While the first season took place in New York, this season deals with Latinas in Los Angeles talking about media and the image of the Latina. For more information, click here. Anthony Ruiz made a return engagement as Mexican billionaire Carlos Slim (billed on the show as "the wealthiest man on the world" or "the richest man in the world") on "Late Show With David Letterman" (CBS). To see the skit, click on the video below. Eric Robledo and Frank Robles, shown at left and at right, respectively, are starring in Julio Ramón Ribeyro's Fin de semana. The play is directed by Diego M. Chiri and is running in July and August at Repertorio Español, located in the Rose Hill neighborhood of Manhattan. For more information, click here. 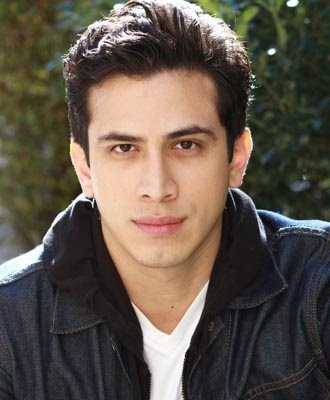 Gerardo Gudiño will star opposite George Bass and Mariana Buoninconti in Walter Ventosilla's Flor de lirio. Directed by Julián Mesri, the play will be presented in September and October at IATI Theater in Manhattan's East Village. For more information, click here. Mônica Steuer, shown at right, will be playing Sylvia Plath to Rebeca Alemán's Frida Kahlo in Néstor Caballero's Musas. Directed by Iraida Tapias, the play imagines a meeting between the Mexican painter and the English poet. Performances will take place at the Greenhouse Theater Center in Chicago, Illinois. For more information, click here or here. Laura Patalano and Harmony Rose Santana star in You're Dead To Me (written by Adelina Anthony and directed by Wu Tsang). The short film has been hitting the film festival circuit; its next screening will be in August at the Martha's Vineyard African American Film Festival (MVAAFF) in the town of Oak Bluffs, located on the island of Martha's Vineyard in Massachusetts. For more information, click here, here or here. In this edition, Tío Louie interviews filmmakers (and brothers) Rashaad Ernesto Green (Gun Hill Road, an episode of NBC's "Grimm") and Reinaldo Marcus Green (Stone Cars), who together have created Green Brothers Films. The interview took place at the July edition of the Prime Latino Media Salón (presented by Tío Louie, HOLA and United Latino Professionals-New York) on Thursday, July 23, 2014 at Meridian 23 Bar and Lounge in Manhattan's Chelsea neighborhood. He asked the Green Brothers about their recent work, their philosophies regarding casting and even their $0.10 worth (what used to be known as your opinion, or your "two cents", but has since risen in price due to inflation) about the importance of creating a community of artists. ​​​Meet the two brothers who are blazing trails successfully in their own respective way and collaboratively as proven recently with the acceptance of their film project, Big Man, at New York’s Independent Film Project (IFP) in the Project Forum for September 2014. ​​​Being our brothers’ and sisters’ keeper is more than a philosophical belief; it’s an essential business principle that drives our community in order to gain an edge ensuring a great degree of success. These were the pearls of wisdom they shared at the event. 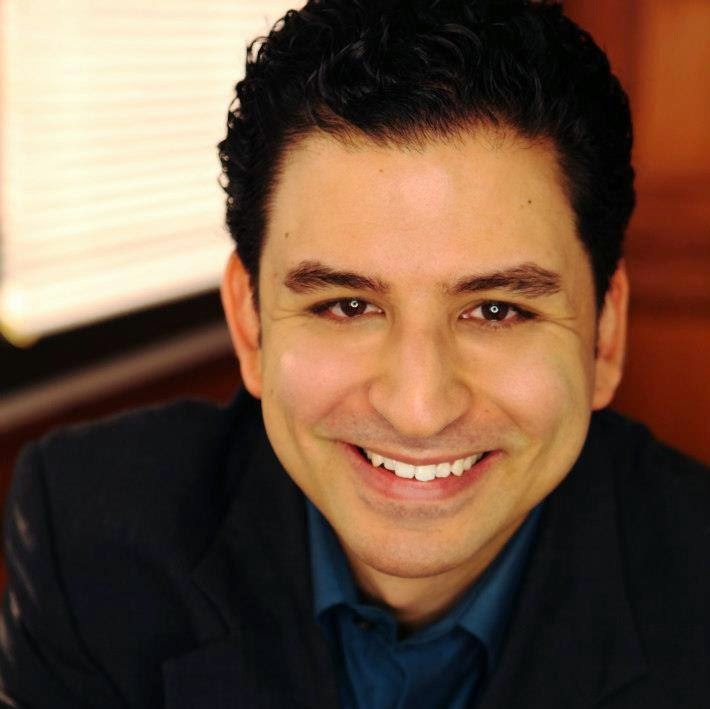 • Reinaldo, what prompted your career change into filmmaking? I was Director of Talent, Acquisition & Diversity at AIG. It was a great role and I was making nice money. Diversity is tricky when it comes to the corporate world. There was lots of window dressing, which happens in many of these departments. I had gone through a break-up with a girlfriend and then wondered if something happened to me, what would define my life? My brother at the same time was making his feature film, Gun Hill Road. I was 27, 28 [years old] and wondered what other options were out there. I came across the NYU website and explored getting an MBA and MFA and thought I could leverage my corporate experience and merge it with the film side. I felt NYU was the best film school. I had to make a short film with my brother and someone else. I had a friend act in it. I didn’t think I would get in and then I did and had to make a decision. I figured I was young enough and did not have a family and that was 3.5 years ago and I have not looked back. • Rashaad, explain how you got the opportunity to direct episodic television on "Grimm" for NBC when executives don’t like to gamble with a $4-5 million budget for one program? They have a valid concern. It takes a pro to be in there and deliver a show on time. It’s fast-paced and stressful. You have a responsibility for 100 people. If you don’t have a feature that can demonstrate your ability it’s difficult. My agent had forewarned me that it would be difficult to direct for TV. He felt that it would be easier to direct a second film. Many of the showrunners and networks rely on the Old Boys Club. That is the business formula and it’s not going to change. But we need to be improving our game and producing great works to prove that you’re cut out for it. I wound up recommending a fellow filmmaker from a 2009 New York International Latino Film Festival. She thanked me for the letter of recommendation that helped her with the Emerging Writers Fellowship at NBC-Universal and she suggested that based on Gun Hill Road, which she loved, that I should participate in the NBC-Universal’s Directing Diversity Fellowship. • Reinaldo, as a narrative film director how did making Stone Cars, your short film set in Africa, tap your casting capabilities? As a young filmmaker the assumption is that you always need a star aligned with a film. If you look at the basic human instinct that anybody can be an actor, that’s how the non-traditional form of casting was helpful in this process. We used non-professional actors and made them professional. The acting is superb, because they desire to act. They study theater and they want to be acting. This film gave them a platform. When I ride the train in NYC, there could be someone who fits a part. It’s about keeping an open mind and someone who has a burning desire to engage in the arts can also do it given the right platform. Which of my professional colleagues in the business world would have thought four years ago that I would be having the filmmaking career I have now. It’s about keeping your eyes open. You never know where you will get a story or actor. • Rashaad, what do you look for when casting? I look for truth. And that goes from the second that they enter the room. It’s how they present themselves, before they even read anything. Are they putting on a show or are they being a human being? It’s okay to be nervous, because it shows truthfulness. Sometimes actors feel that they have to blow you out of the room and you never got to the real them. I like actors that are grounded. Familiarity with the material is a major plus. It’s okay to look down at the paper– as long as they keep the pace alive. As soon as they start and stop and apologize and have to start again, it’s awkward for the two of us. • Reinaldo, how was going to the Cannes Film Festival with your short film, Stone Cars? It’s the cream of the crop. They do take care of the filmmakers there. It is a spectacle. It’s everything you can imagine a film festival can be. They care about the film and the filmmakers. They care about your future. It’s about the film and the actual work that goes into it. It’s amazing. It’s inspiring for someone who goes there. I am over the moon that I was selected. I try to analyze, was it luck or did I deserve it? I have to enjoy and believe that I deserved to be there and they made me feel that way. I was one of 16 films from a total of 1,600 films submitted. • Rashaad, what are your $0.10 worth of wisdom in regard to the importance of community and networking for someone’s career in our industry? It’s who you know. That’s how this business works. Your work speaks for itself. People like helping people that they like and that is very important in this industry. I would be remiss, when it comes to my brother. It was my father who instilled that philosophy with us growing up. He always said that you only have one brother. He had only one brother. We would bicker as children and he would always say, “You only have one brother.” We lost our father last year. He was a single father. We’re very blessed to carry his legacy as we continue in our careers. • Reinaldo, why a production company with your brother? My brother is the whole reason I have entered this field. I have read all of his scripts and every iteration. I knew him when he was acting. When I see others with their own business or family-owned business and then I thought, “Why can’t I?” Moreover, if I had to open this business, why not with my brother and what would it be? And that’s where the idea arose, “Why don’t we make films together?” I was around while he was making his feature-length film, Gun Hill Road, and it was a grueling experience. I then thought, “Why can’t I make his experience better by supporting him through the process– and to make our own films and content? How can we join forces– two are always better than one? The happiest day in my brother’s life was the day I got into film school. However, there are risks and we are brothers and I don’t ever want this business relationship to put that brotherhood at risk. But we’re grounded. We are a team and whatever we produce, we put time and effort into it– rendering quality that is well thought out. For more information about Green Brothers Films, click here.